EOVE develops and manufactures innovatives products to improve care and quality life with greater freedom for Adult ans Pediatric Patients who suffer from breathing disorders and chronic respiratory diseases. EO Series Ventilators combines efficient therapy with best in calss performance and ease of use for clinicians and care givers. 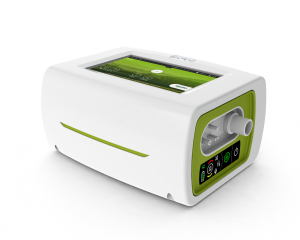 Thanks to EO-series Ventilators any Patient can be equipped with a similar backup ventilator module that can be automatically set with identical parameters by simply “Plugging” the EO-vent Module in the EO-Bedside Station to automatically save the current settings in the EO-Vent Module memory. EOVE Click & Go Concept avoid any risk of cable miss-connection and ensure Safe Patient mobility without any compromize on the treatment delivery. Based on a sophisticated 7″ Color Touch screen, EO-Series Ventilators GUI (Graphic User Interface) helps the clinicians and the Caregivers to ensure appropriate setting selections based on patient’s profile, airway interface in use and circuit configuration. Clinicians will be able to save up to 4 Presets with specific ventilation modes and configurations according to Patient profil and required treatment. Presets are easily accessible on Patient screen. Thanks to EOVE Click & Go Concept based on swappable EO-Vent Module and a wide variety of mobilty solutions, it makes possible for all Patients to go to school, attend Ball-game or simply travel to visit family. Weighting only 1,8 kg with 6 hours embeded battery life EO-Vent Module offers a unique Click & Go Concept including EO-Vent Module and Docking Station, the EO-Series Ventilator allows the Caregivers and Family to easily swap EO-Vent Module to move from Bedside Station to a nomad Bag or a Travel Docking fitting on a wheelchair. 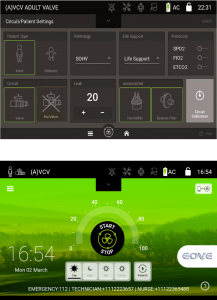 Thanks to EO-Remote Vision App, the patient will allways keep control on his ventilator through remote Tablet PC or his Smartphone. 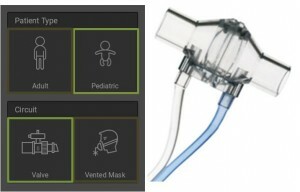 Based on a unique and innovative blower design with fast response time down to 80ms, EO-Series Ventilator offers best in class Ventilation features for Pediatric and Adult Patients with smart sensitive triggers and a wide range of Tidal Volume from 30 to 2500ml. Combining Single or Double Branch circuit with tidal Volume down to 30 ml and Respiratory Rate up to 80 bpm, EO-Series Ventilators offers exceptional performance to treat Newborn Patient. Management effi ciency with scheduled preventive maintenance. access for Software and Hardware version upgrade. 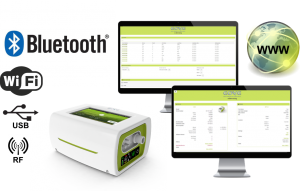 Wireless Integrated solution Wi-Fi, Bluetooth and RF Port, offer continues communication with external monitoring systems allowing extended diagnostic tools like overnight screening with SPO2, CO2 and remote-monitoring solution. Thanks to customizable 7″ color touch screen, the patient get direct access to 4 presets saved by his clinician. Greater mobility thanks to Click & Go concept allowing easy and safe travel. 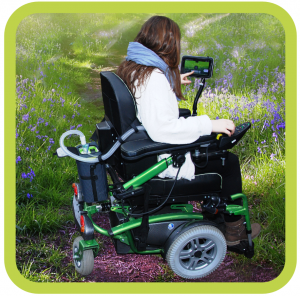 With only 1,8kg and 6 hours embeded battery life, the Ventilation module and Click & Go concept allow the Caregivers and the family to easily move the ventilator from the bedside confguration to light nomade bag or travel bag on the wheelchair by simple click. Greater safety thanks to Click & Go concept, no more risk of mis-connection or dammaged cable. With a continues visual control on alarm messages, EO-Visio Control system offer peace of mind for Patient and family while traveling with wheelchair or just for a walk. Thanks to 7″ color touch screen and embeded online help, EO-150 Ventilator helps clinicians and caregivers to easily setup proper treatment. Clinicians are able to save up to 4 Presets with specific ventilation modes and configurations according to Patient profil and required treatment. Presets allow better support during Rehabilitation protocols where multiple settings and ventilation modes are required. External SPO2 / CO2 monitoring connexion facilitate settings adjustment for the clinician and therapy control during the first months of treatment. 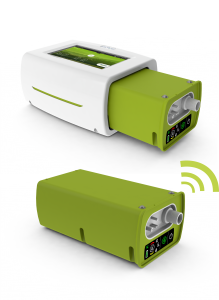 EO-Series modularity concept allow the service providers to better manage product inventory accordign to patient profile and treatment – ie: Life support pack = 1 x EO-150 + 1 Backup ventilator module instead of 2 complete devices. Simple and user friendly EO-Series system allow significant time saving for nurses and technicians when visiting patient at home. Swapable ventilation module offers quick and safe solution for field service technician. 360° connectvity and SAS – Service Application Software improves field service planning and service cost reduction.